Any chance you could knit American/English style on the YouTube video? Some of us don't do Continental and it looks a little different. Thanks. I prefer Continental, that's how I knit. I realize it's a little different than English, but if you just make the required stitches the way you personally knit it'll turn out fine! Well, it isn't turning out fine! I have spent hours trying to figure it out. She said something at the beginning that makes me think one does not start out with a purl for each row. So, this is what I want to do: four stitch edging on each side (8), 33 in the middle for a total of 41. Maybe I'm just mis-stitching as I go along. She said multiples of three, repeat for each row. Help! You know "she" is me, right? I just cast on 41 stitches and knit the first four stitches, worked the stitch pattern to the last four, and it works out fine. You must be making an error somewhere. It doesn't matter if you knit continental, English, Portuguese or whatever style. A yarn over is still a yarn over. A knit is still a knit. A purl is still a purl. You just make the stitches however you normally do in whatever way you knit. 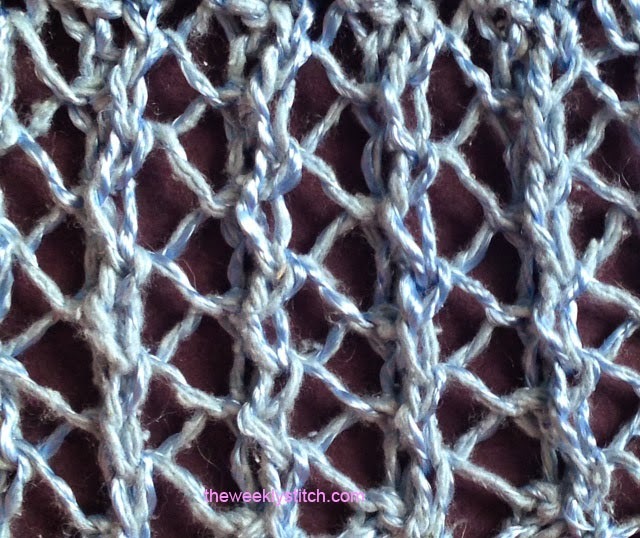 The stitch pattern does start with a purl. I'm not sure what was said at the beginning of the video to make you think otherwise. Anyhow, if you are using the correct multiple, it should work out even with the extra stitches you've added for the border. You just need to make sure you are making all of the increases and decreases. Thank you! I have just had a bite to eat, so I'll keep at it. If it works for you it should work for me. I must be getting distracted and missing a stitch somewhere. I really appreciate your getting back to me, and your weekly stitches. Well, this was my second attempt at making lace, and I've decided I've chosen the wrong yarn -- baby alpaca is too soft to define the stitches so I can see them clearly and the yarn keeps splitting; and the size of the needle is too small (4). So, I will put it aside for a while and maybe I can do something with the portion that I have completed or maybe continue on. My mind began saying: purl one, knit two together. The only way to knit is with a yarn over, so I quit saying "yarn over." Thanks again!